Organisers of the 2018 OPAP Limassol Marathon GSO have announced the date and opening of early bird entries for the 2018 race. They have also confirmed that the event has received a record number of early bird entrants within the first week of the launch. The 12th OPAP Limassol Marathon GSO will take place on the weekend of Saturday 17th and Sunday 18th March 2018, and a generous early bird discount of 40% is offered on all competitive races until the end of October. With individual entry fees starting at just €36 for the marathon and €27 for the half marathon, now is the time to sign up for one of the most exciting sporting events in Europe. The OPAP Limassol Marathon GSO welcomed 15,000 participants across six races at the 2017 event, with athletes coming from near and far to enjoy the flat and fast course, friendly atmosphere and stunning natural scenery. It was the most successful year to date, with a remarkable number of runners achieving a PB on the straight, traffic-free roads. With the organisers keen to build on this year&apos;s success and deliver yet another first-class event, the 2018 event will feature many exciting additions based on feedback received which will be unveiled over the coming weeks. 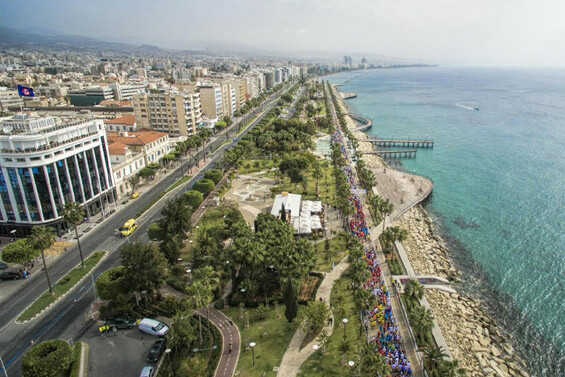 The OPAP Limassol Marathon GSO offers six different race distances over one weekend. Race weekend kicks off with the 5K Corporate Race and the 1K Youth Race on the Saturday, followed by the AIMS-accredited OPAP Limassol Marathon GSO, the 13.1-mile Half Marathon, the Petrolina 10K Energy Race and the 5K City Race on the Sunday. Together these races offer a complete sporting experience for all ages and abilities, which is very much embraced by the thousands of participants and spectators who come to the start line to cheer on the contestants. Overseas visitors can expect a friendly and festive atmosphere as well as the highest international running standards. This will be the second year that the event takes place over two days, to allow for a full weekend celebration of running. The event was extended to two days in 2017 to great success, making it highly attractive to visitors travelling to Cyprus from overseas, as it means they can combine a weekend of sport, activities and entertainment with a holiday in the beautiful Mediterranean spring. This is further underlined by the excellent packages available to enable athletes, running clubs and their friends and family to enjoy all that Limassol has to offer, which will be launched shortly. The 2017 OPAP Limassol Marathon GSO took place under sunny skies on Saturday 18th and Sunday 19th March, welcoming a record 15,000 participants to the island&apos;s largest sporting event. The flat and fast course, which covers the spectacular coastal road of greater Limassol, is ideal for first-time runners as well as for professional athletes looking for a PB or qualifying time. In addition, Limassol boasts a beautiful climate, stunning beaches and plentiful history and culture, making it a highly enviable destination for a race. The weekend concludes with a fantastic closing ceremony and after-party to celebrate the many sporting achievements of the weekend. The 2017 OPAP Limassol Marathon GSO men&apos;s title was claimed by Edwin Kiprop Kiyeng with a time of 02:15:04, and Gladys Jepkurui Biwott secured the women&apos;s title with a time of 02:40:41. Go to http://www.limassolmarathon.com for further race details and to sign up now. You can also like the Facebook page and follow @RunLimassol #RunLimassol #weadvance on Twitter to keep up-to-date with all the latest news about OPAP Limassol Marathon GSO.